Fabulous Art Deco diamond and sapphire ring featuring 1.50 carats of Old European cut diamonds, beautifully accented by french cut sapphires. Shop this ring HERE. Lovely 1920's diamond and 18K white gold ring, featuring a center 0.81 carat Old European cut diamond! Shop this beauty HERE. A little pop of color in this beautiful Art Deco diamond and ruby ring! Shop HERE. Jaw dropping Art Deco diamond ring featuring a center 1.10 carat Old European cut diamond, beautifully accented by blue sapphires. Shop this beauty HERE. 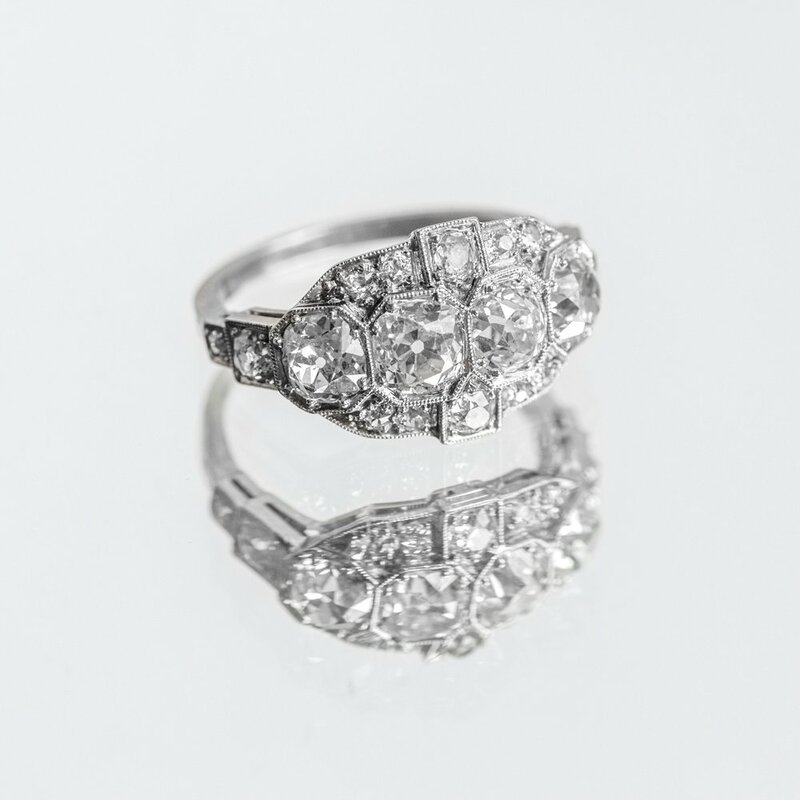 Beautiful Edwardian era elongated diamond ring featuring 1.25 carats of diamonds! Shop this beauty HERE. This Edwardian stunner boasts 1.57 carats of Old European cut diamonds down the center, perfectly framed by french cut rubies. Shop this fabulous ring HERE. The fire in opals gets us every time! Shop this beautiful opal and diamond pendant HERE. Fabulous elongated Art Deco Old European cut diamond ring, featuring 1.78 carats total weight in diamonds! Shop this stunner HERE. 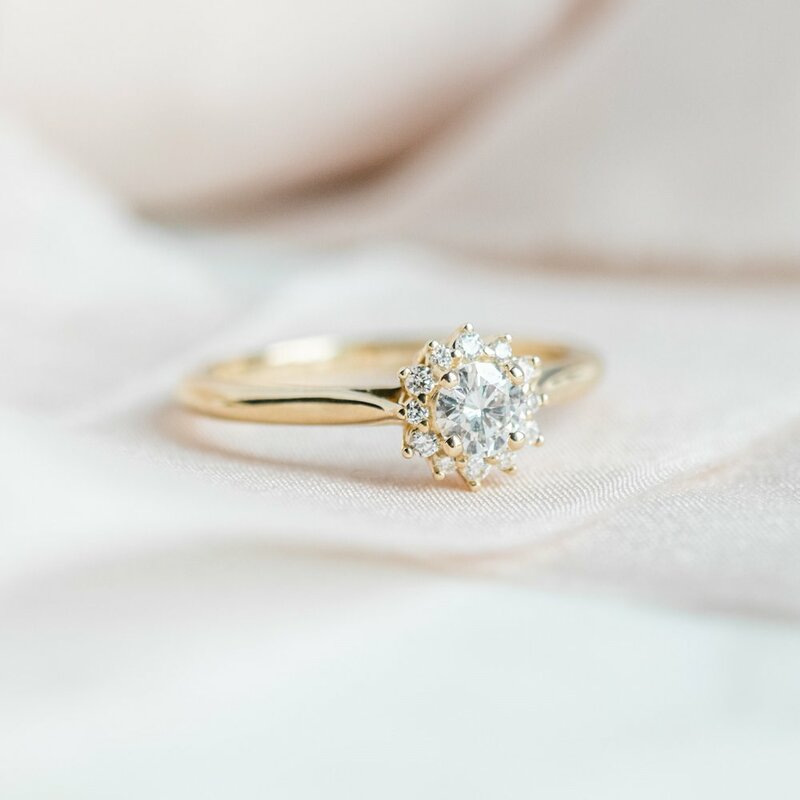 Sweet diamond cluster ring in yellow gold. Shop this ring HERE. Fabulous Art Deco diamond and filigree ring featuring one carat total weight in diamonds! Shop this beauty HERE. Garnets and Gold! Shop this lovely ring HERE. Heavenly Edwardian era purple sapphire and rose cut diamond necklace 💜 Shop this beauty HERE. Stunning early Victorian era diamond and sapphire cross. Shop this gorgeous piece HERE. A three stone beauty! 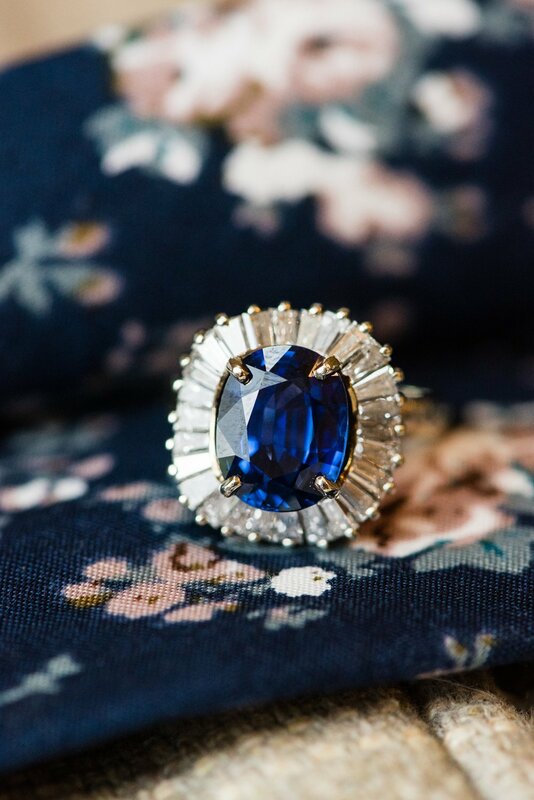 Shop this lovely diamond and sapphire ring HERE. A little wedding inspo for this beautiful day with a gorgeous Galia Lahav House of Couture champagne wedding gown paired with a classic 1.12 carat diamond ring from Walton's! Shop this beauty HERE. A decadent 4.25 carat blue sapphire set in a feminine ballerina style mounting comprised of 1.00 carats of baguette cut diamonds! Shop this show stopper HERE. Photography by Ivory Door Studio. A pop of pink sets this lovely ring apart from the rest! 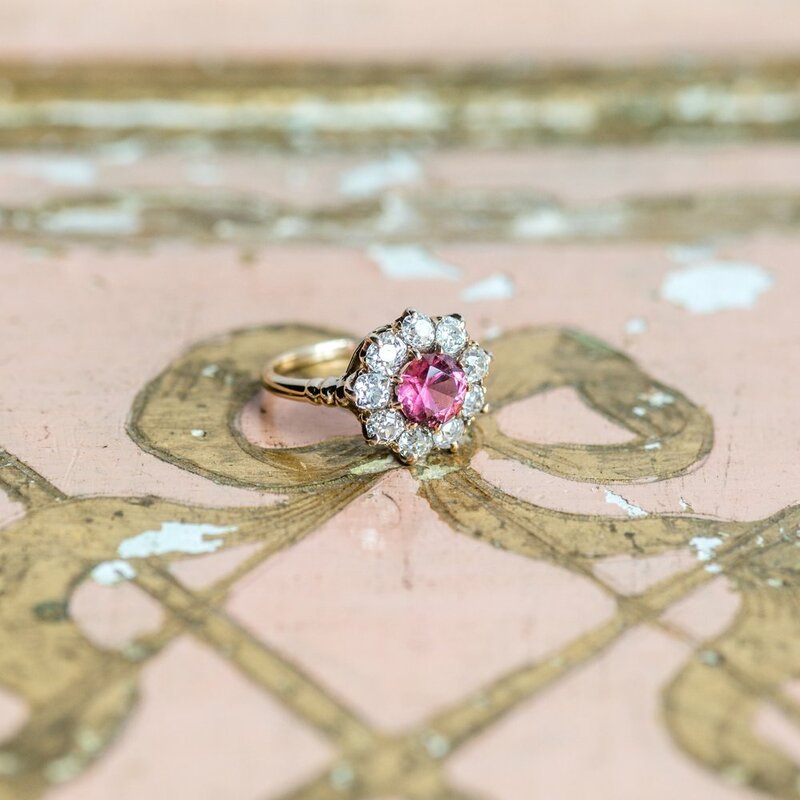 Shop this beautiful pink tourmaline and Old Mine cut diamond ring HERE. 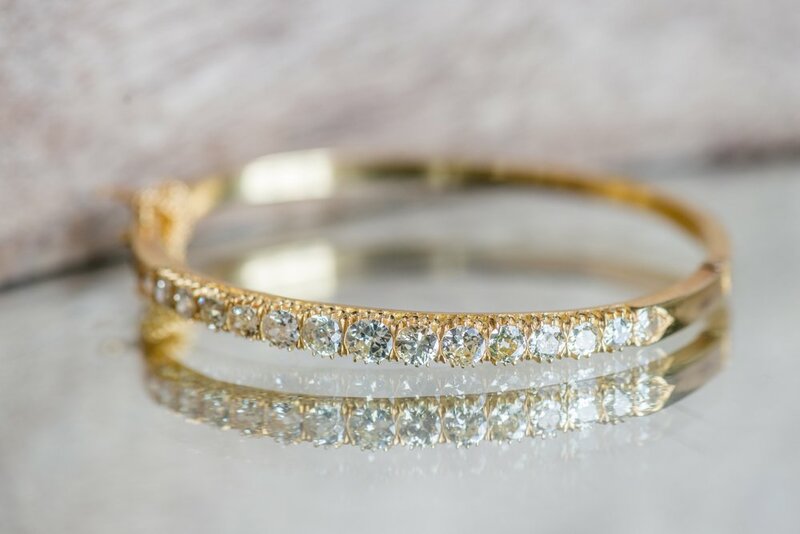 A stunning Old Mine cut diamond bangle bracelet perfect for all wardrobes and all occasions! Shop HERE. Give mom flowers this Mother's Day that will last a life time! Shop these sweet pansy enamel earrings HERE. Happy Cinco de Mayo! 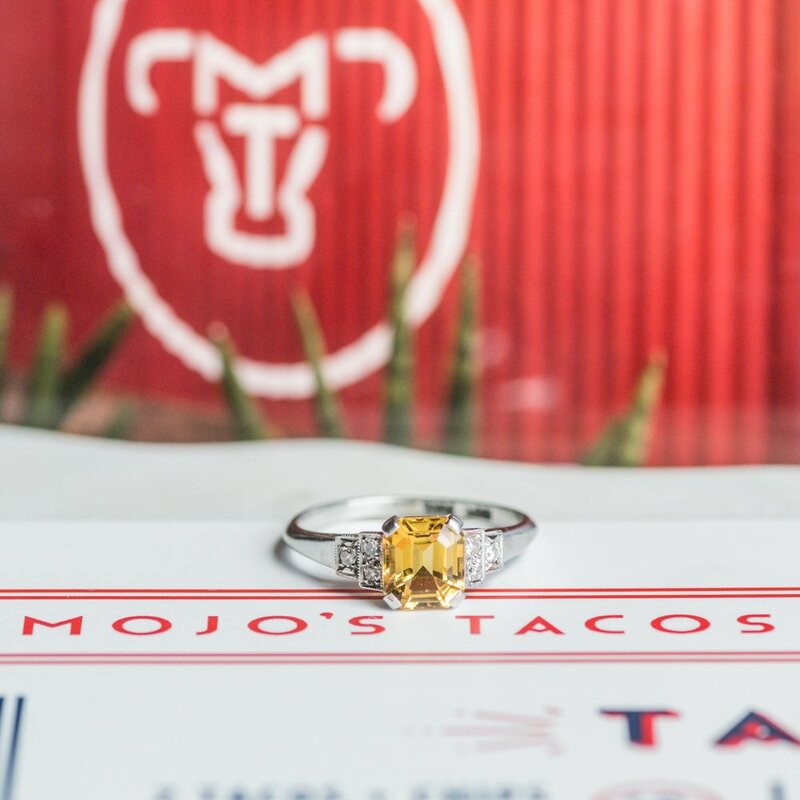 Something about this delicious citrine ring makes us crave a margarita and tacos... specifically the "Old School Taco" served up by our friends at Mojos Tacos! Shop this beauty HERE. Jaw dropping Art Deco, Old Mine cut diamond ring featuring over 3.00 carats in diamonds! Shop this stunner HERE. Robin's egg blue, turquoise and diamond earring perfection! Shop this lovely pair HERE. A little emerald love for the month of May 💚💚💚 Shop these gorgeous rings HERE and HERE. The sweetest diamond bow pendant we ever did see! 🎀 Shop this Art Deco beauty HERE. Classic and timeless, Art Deco beauty. 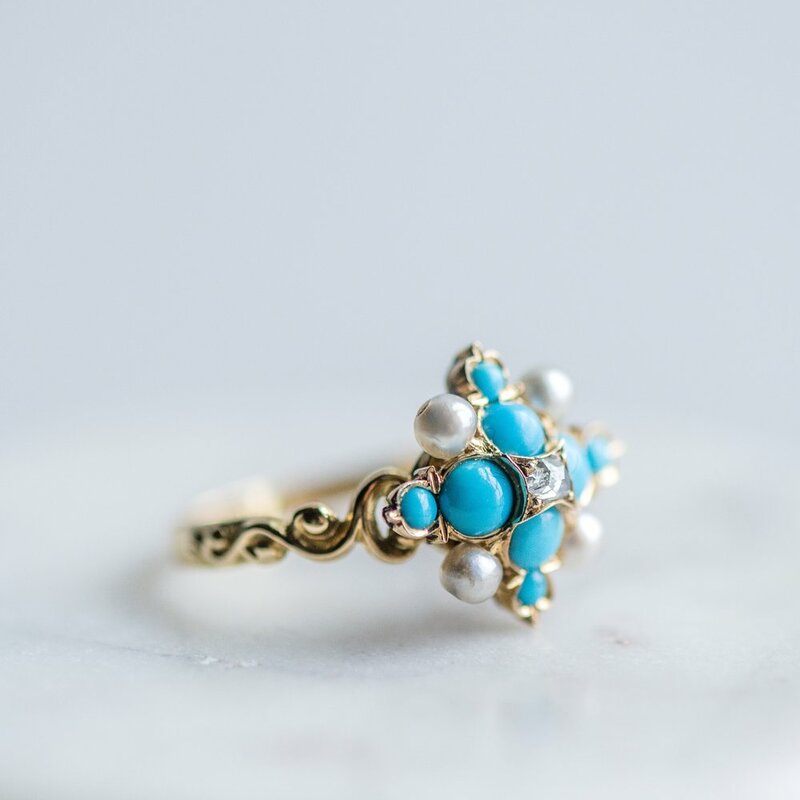 Shop this gorgeous ring HERE. French cut sapphire accents beautifully compliment the center 0.85 carat Old European cut diamond in this Art Deco ring! Shop this stunner HERE. The perfect garnet and diamond ring under $800, doesn't get much better than that! 🙌 Shop HERE. Any May babies out there who would love this fabulous emerald and diamond ring?! Shop this beauty HERE. A flower amongst flowers! Shop this fabulous Victorian era emerald and Old Mine cut diamond ring HERE. Photography by Morgan Franklin Creative. Whimsical platinum topped gold and diamond ring (and there's even earrings to match!) Shop this lovely ring HERE and the matching earrings HERE. Romantic Victorian era diamond and sapphire ring featuring a center 1.12 carat sapphire. Shop this beauty HERE. This Old Mine cut diamond cluster ring features to die for black enameling and engraving details! Click HERE to view this beauty in all its glory! Who would rock this Old Mine cut diamond beauty as their engagement ring?! Shop this stunner HERE. Rise and shine with this lovely ray of sunshine! ☀️💍 0.44 carat Old European cut diamond set into an Art Deco Orange Blossom mounting. Shop HERE. Something blue 💙 Shop these fabulous diamond and sapphire earrings HERE, and this gorgeous diamond and sapphire ring HERE. We're teeing up for a great Saturday with these emerald and diamond beauties! Shop HERE. A fabulous Art Deco diamond trio! Shop these beauties HERE, HERE and HERE. 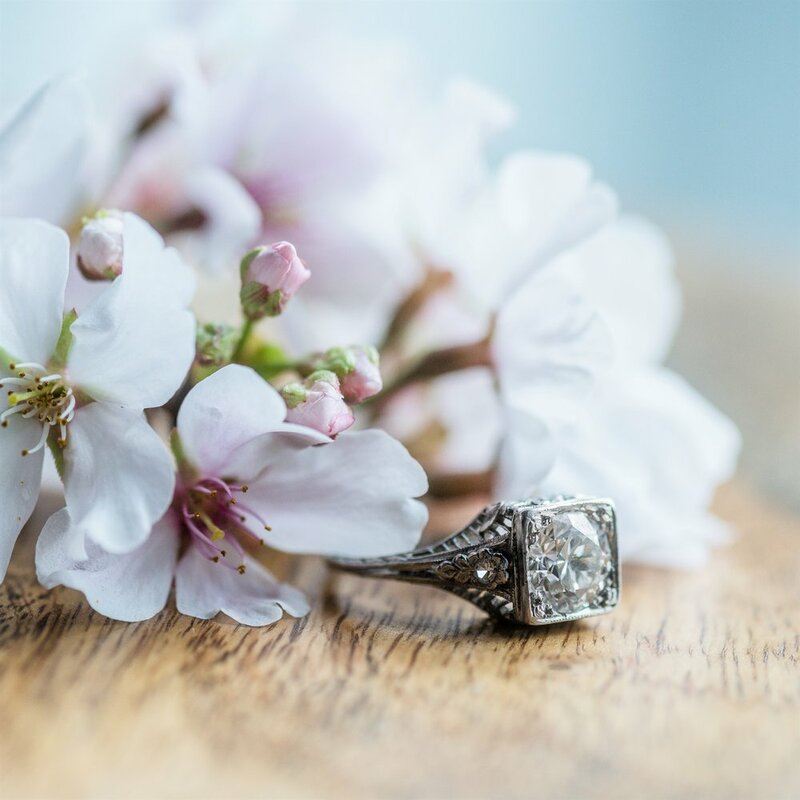 Sometimes you've got to stop and smell the flowers, or at least, admire the flower details on this fabulous Art Deco ring! Shop this 1.40 carat Old European cut diamond beauty HERE. So fresh and so clean! 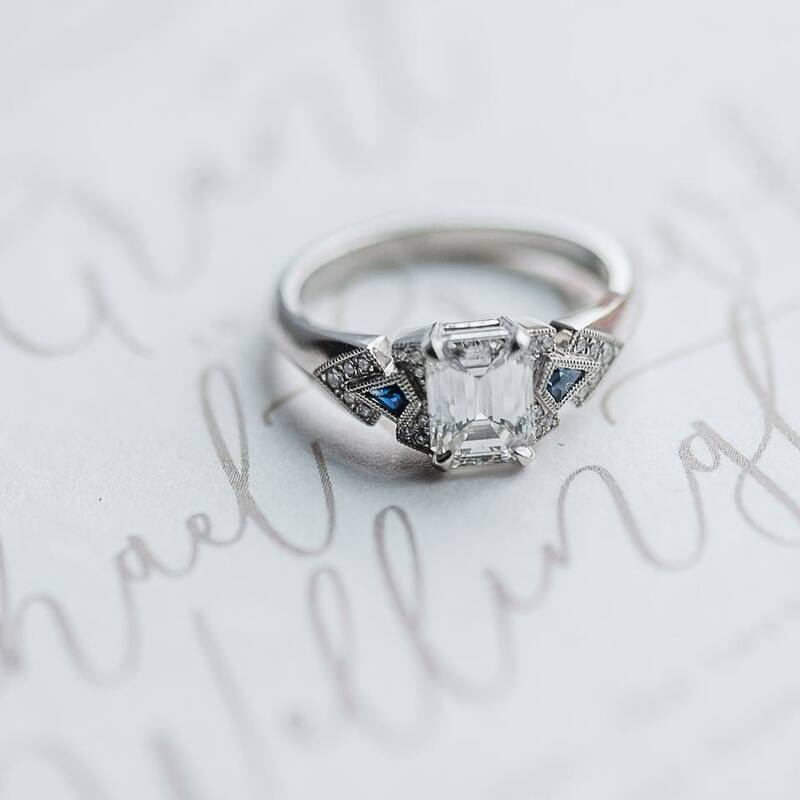 The crisp lines on this Art Deco 1.56 carat emerald cut diamond beauty are just perfect! Shop this ring HERE. 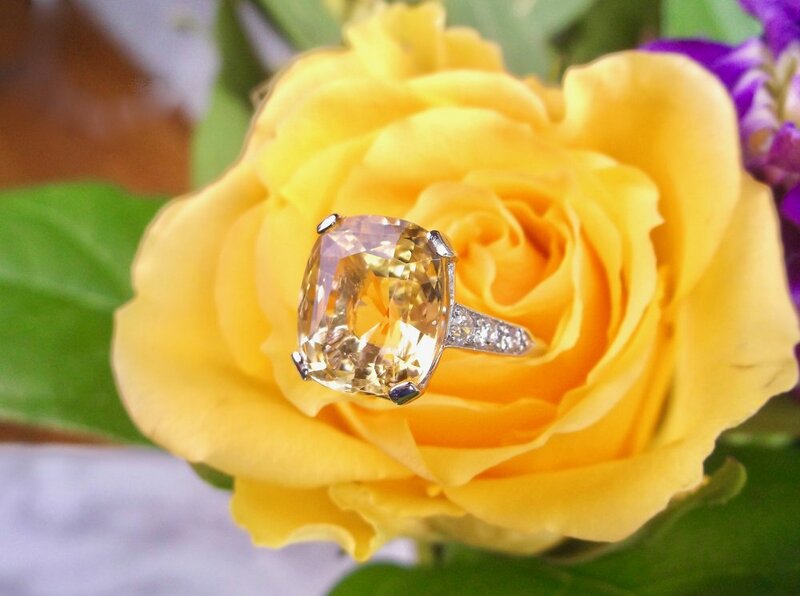 Like a welcoming ray of sunshine, this stunning 5.85 carat yellow sapphire and diamond ring is sure to brighten your day! Shop this fabulous piece HERE. The bright turquoise in this Victorian beauty reminds us of Easter Eggs! Shop this lovely ring HERE. What bridal dreams are made of! Shop this stunning Art Deco 0.70 carat Old European cut diamond and platinum ring HERE. We are just going to stare into the depths of this ocean blue aquamarine and pretend we are on the beach for spring break! 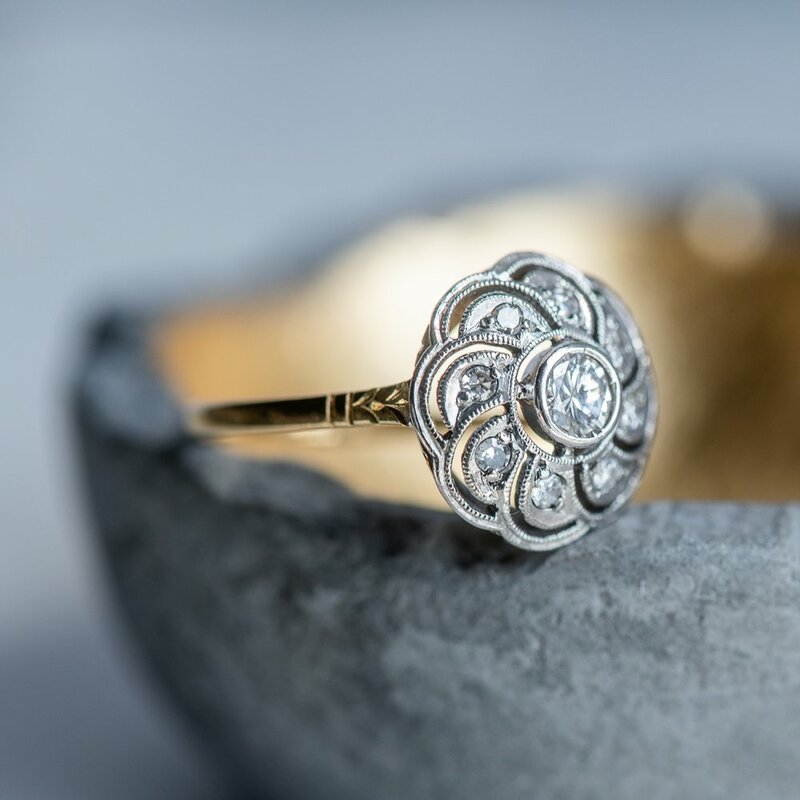 Shop this stunning ring HERE. Go for the gold! Shop this fabulous 0.87 carat diamond ring set in yellow gold with smaller diamond accents HERE. This Art Deco beauty has us feelin’ hot, hot, hot! 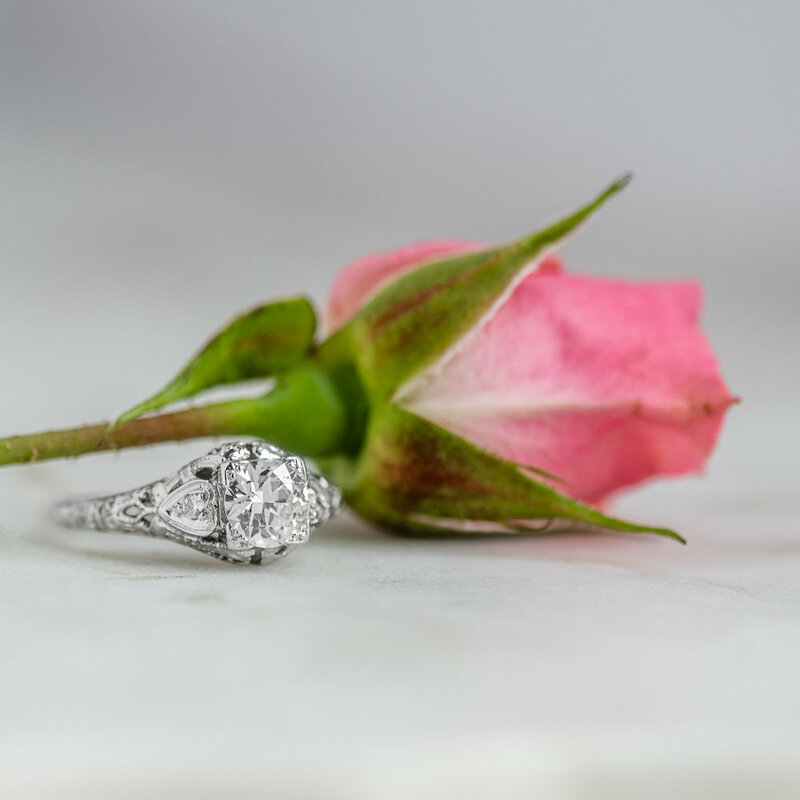 🌶 Shop this fabulous 1.06 carat Old European cut diamond ring HERE. I mean, goodness gracious! How do you even choose?! 💍💍💍💍 Shop these stunning Art Deco beauties HERE, HERE, HERE, and HERE. A Victorian era yellow gold horseshoe, diamond, pearl and green enamel necklace that is sure to be your good luck charm! Shop this fabulous piece HERE. 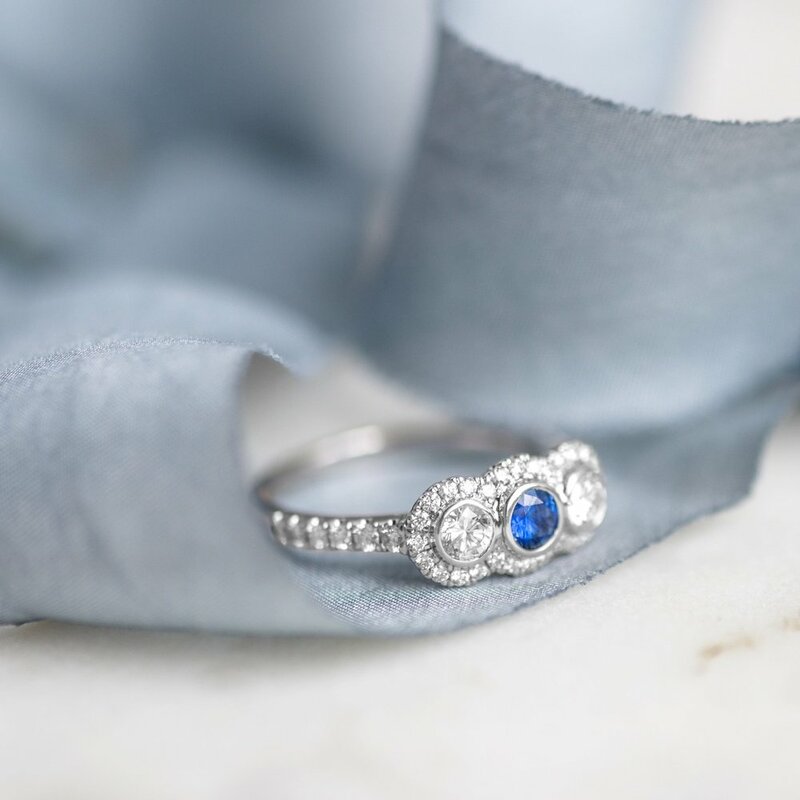 Bright lights, big city 💎🏙️ We are loving this Art Deco diamond and sapphire ring that was once a stick pin! Shop this lovely ring HERE. Crisp and clean 0.93 carat antique marquis cut diamond, accented by a baguette cut diamond on each side. Shop this beauty HERE. Nothing gets our hearts going quite like a studly Victorian man 😏 💕(Or perhaps it's a woman... you decide! 😉) Tap HERE to shop! A stunning Old European cut diamond, stylish yellow gold, an antique jewelry box and a little lace. Need we say more?? Shop HERE. Our favorite thing about spring? All the beautiful blooms and colors that remind us of gemstones! Like this fabulous, circa 1920's, ruby cabochon and diamond necklace all set in platinum 💎 Shop this gorgeous piece HERE. We are headed into the weekend dreaming of this beauty! Circa 1920's 0.57 carat Old European cut diamond paired with fabulous filigree and diamond details. Shop HERE. Anyone else having a major craving for donuts and diamonds this morning?? Shop this mouthwatering 3.19 carat Old European cut diamond ring HERE. Classic three stone Old European cut diamond ring. Shop this beauty HERE. This Art Deco filigree and onyx bracelet has us feeling so dark and mysterious 😏🔮Shop this moody beauty HERE. Up close and personal! Shop this beautiful diamond ring HERE. 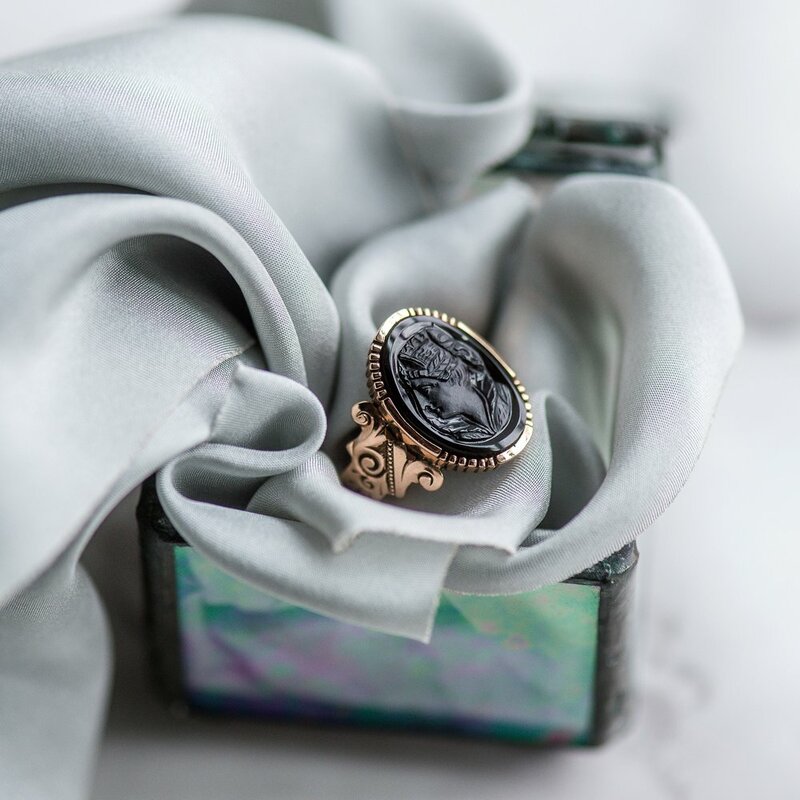 Some may find it a tad morbid, but we find this memori mento ring utterly enchanting and a beautiful way to remember a loved one ❤️ The ring is inscribed “Robert Richardson” on the inside, along with gorgeous engraving, black enameling details, and a lock of braided hair surrounded by pearls. Shop this lovely piece of history HERE. The perfect final touch for a gorgeous gown (...we’d also pair it with some comfy lounge wear on a casual Sunday afternoon 😉) Shop HERE. 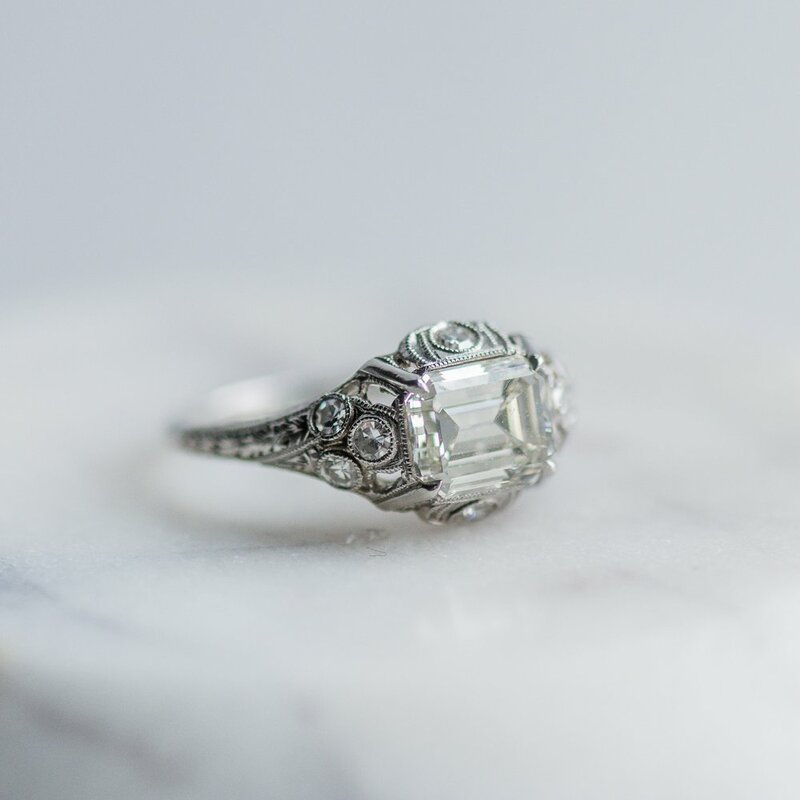 This sweet Art Deco ring sure does bring us joy! Shop HERE. Sleek and stream line 1.38 carat emerald cut diamond, beautifully accented by a pop of color with these sapphires! 💙 Shop this fabulous ring HERE. A feminine, Art Deco beauty! 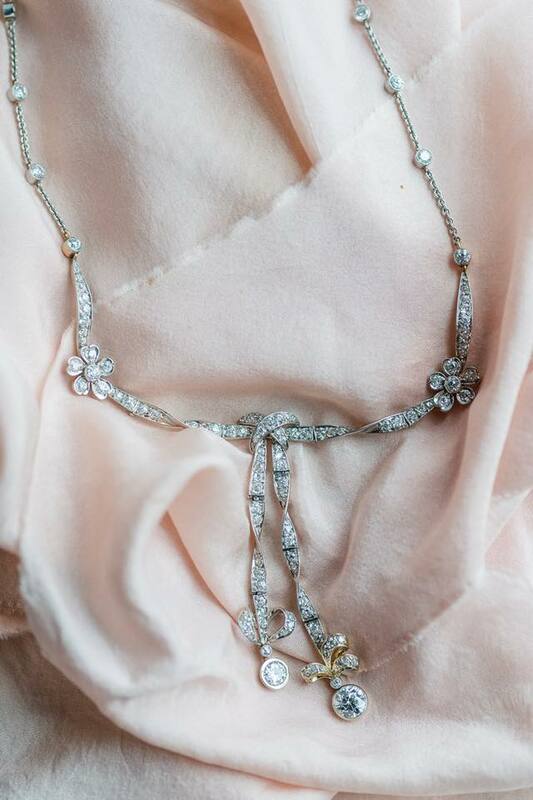 Shop this fabulous Old European cut diamond and platinum necklace HERE.